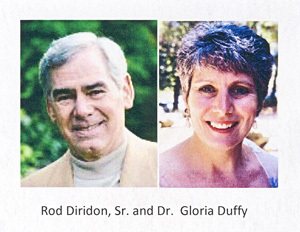 The Committee to Celebrate Dear Mad’m Day is honored and delighted to have Rod Diridon, Sr. come and speak to us for this occassion. Rod said in his reply, “I’d be glad to share thoughts about Stella, the Clear Creek Claim and our even earlier times at the Classic Hill placer mine about 12 miles up Indian Creek near the state line. “Grandfather John Covert filed three mining claims at Clear Creek with Fred Crook around 1910 and Fred, an authentic mountain man, stayed there to do the annual “claim improvements” to hold title. Grandpa wondered off to earned and loose a couple of fortunes. Seems he was a brilliant builder but imbibed a bit too much. “After quite a time in set design and construction in Hollywood, Grandpa helped to build the Hurst’s Wintoon “Castle” from the mid 1930s to the late 1940s. “After an altercation with a couple of loggers in a Dunsmuir bar, Grandpa resettled (was resettled) on the Classic Hill Mine that was purchased by Grandma Allie’s Redding-based logging family (Middleton, Cocherine, and Notley) for timber rights. In the late 1940s and early 1950s Grandpa worked the claim illegally in the winter when the streams were muddy so his tailings weren’t discernible. It was a massive old systems with miles of ditches and high flooms, hydrolic “giants” and piping, a small town (blacksmith shop, stables, hay shed, machine repair shop, large orchard, etc.) at the main HQ bunk house and superintendents home dating to the late 1800s…. Rod Diridon, Sr. the son of an immigrant Italian railroad brakeman, is called the “father” of modern transit service in California’s Silicon Valley. Raised in Dunsmuir, California, he worked his way through college as a railroad brakeman and fireman receiving a BS in accounting in 1961 and MSBA in statistics in 1963 from San Jose State University. Rod served four years as a naval officer with two Vietnam combat tours.